What's on the agenda at China's 19th Communist Party Congress? The Communist Party which runs China, the world's second-largest economy, is holding its 19th National Congress, an occasion considered to be China's most important political event in recent years. BBC China correspondent Stephen McDonell put some of BBC News readers' questions to Dr Victor Gao, a China expert who was an interpreter for former leader Deng Xiaoping, during a BBC Facebook Live video on Friday. Everything in the party congress will be highly structured. Xi Jinping will lay the groundwork for initiatives to come. Eventually they will adopt the Central Disciplinary Commission Report, talking about anti-corruption. 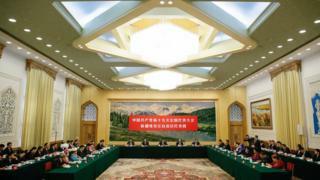 They'll set up the new Central Committee for the coming five years, members of the Politburo (usually made up of 24 or 25 members of the country's central political bureau), and who'll be the party leader going forward. How many of President Xi Jinping's allies are expected to get in? There are 89 million party members. The Central Committee will have 225 members. Eventually, they'll need to elect a Politburo which normally will have 25 members. As to the Standing Committee (an inner cabinet which groups together the country's most influential leaders), we don't know if it will remain at seven or be reduced to five. Because of Xi's popularity, it's likely his followers will be elected into the Politburo. He'll emerge more consolidated in his power and influence over the party. North Korea: Does latest nuclear test mean war? What about Britain's future with China? As Britain is a very important financial centre, from China's perspective, China wishes Britain well and will overcome any uncertainties over Brexit. China-Britain trade is on the rise, as well as increased financial cooperation and the number of people studying in Britain. I hope Britain will emerge stronger and invigorated. Is it possible to give the citizens of China more freedom in the current political system? Absolutely, we want to have more freedom, more democracy, more liberty. Every country has different circumstances. We had 100 years of turmoil and civil war in China. Only since 1949, when the Communist Party became the ruling party, did we manage to have longer periods of stability. Now I think promoting rule of law, promoting greater democracy is a political necessity. It has to be done with Chinese characteristics, by maintaining stability. May China be at the pivot point for positive economic progress all over the world? China is the second largest economy by official exchange rate, the largest manufacturing country and the largest trading nation in the world. For it to continue to grow, to be peaceful and friendly with the rest of the world is very important. China's One Belt, One Road proposal is a major initiative. It talks about duration, continental development. This is China's contribution to a new development. What influence does Jiang Zemin still have over Xi? Jiang Zemin retired around 2002-4 but has remained very influential. He's still active in party matters. President Xi has become a very effective leader. He has his own thoughts and visions for China. The 19th Party Congress will further cement his role. Jiang Zemin is over 90 years old. We wish him longevity. Would Xi speak to former leaders Hu Jintao and Jiang Zemin? President Xi is very respectful of former leaders. Chinese people respect the elderly. Each leader has made their own contribution to China's progress. Even though they are not in power they still demand our respect. Taking care of them and listening to them, picking their brains is still very important.